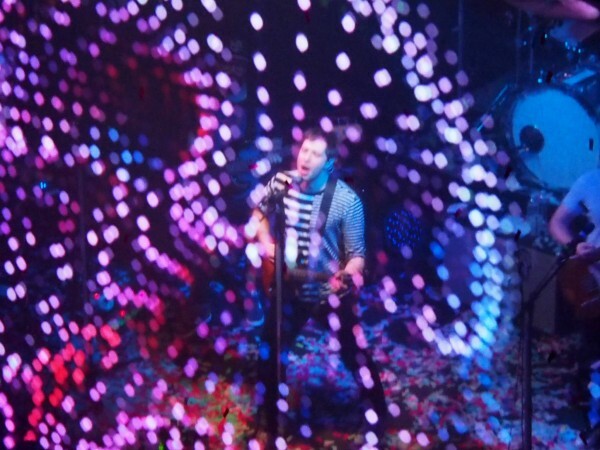 I had previously seen OK Go for the first time about 6 months earlier at The Paradise, a much smaller venue in Boston. 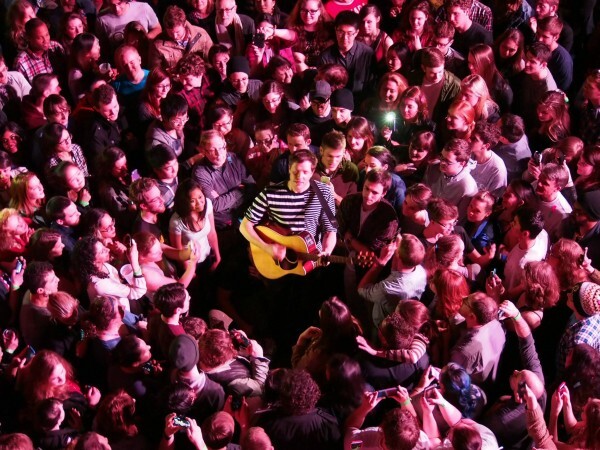 While The Paradise is legendary, it’s much too small to adequately host a band like OK Go. I was glad to hear on their next go around they would be at the much larger House of Blues, right next to historic Fenway Park. 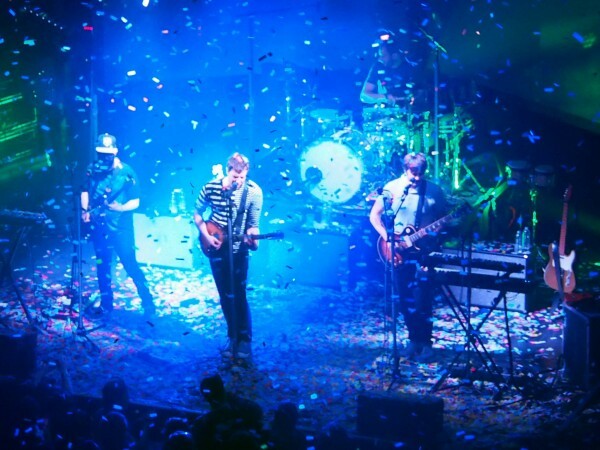 Knowing what a great live band OK Go is, I decided to take my son with me to this show. This would be his first concert ever. While he was not a fan of the band yet, I knew that the theatrics would be a fun introduction into live concert-going. We were a little late for the show due to getting dinner, but we didn’t know the opening band, so it was OK. Come to find out, the opening band was a no-show, so we didn’t miss anything at all. Seeing as how I had already seen them on this tour, I had expected the same theatrics as I had seen previously. This would not be the case, as they wisely decided to mix up the effects throughout the show. The band started out with the lead track from their latest album, entitled “Upside Down & Inside Out”. The band played behind a screen that covered the entirety of the stage. On it was projected band members faces in various distortions, perfectly synched to the live performance happening behind it. This screen stayed up for a few songs, and while I liked the gimmick, I was hungry for the band itself. 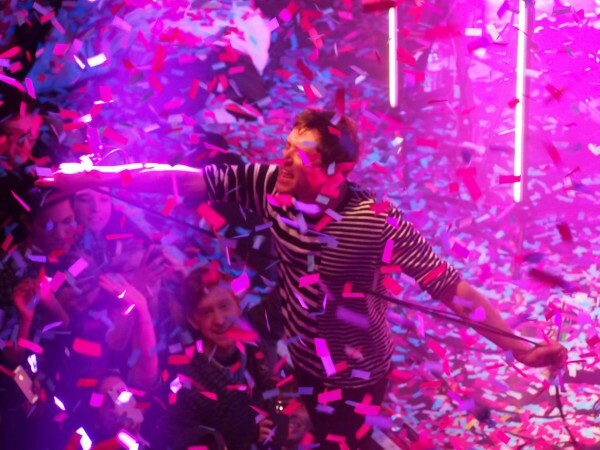 Once the curtain dropped, the confetti started to fly like crazy and the crowd went wild. I want to mention that OK Go’s performance was impeccable, and would have been amazing without the additional visual fanfare. A lot of times you go to shows and you can tell that the album version of a song has been very polished, but in this case they sounded as good as on album, if not better. The live setting adds more power to their already dynamic sound. After a few songs, members of the band took questions from the audience. The singer Damian Koulash fielded most of the questions, remarking often about how “Practical” the Boston audience is. Damian also made a note to mention that the band has close ties to the region and are huge Red Sox fans. About halfway through the set the band took audio samples from the audience and turned that sound into a drum beat, which they then made into an imaginative take on “There’s A Fire”. Damian went down into the crowd for the solo acoustic song “Last leaf”, but there was an audio issue and his voice was not amplified. This had the effect of the entire venue being dead quiet to hear his unamplified voice. It was quite amazing. One noticeable change in their set was the graphics for “Get over it”. At the Paradise show, they were behind a screen that flashed the emphasis words as the band sang them. This time they had a visual of the singer’s face projected from a small camera mounted on the microphone. It was a neat effect, but I was looking for the words as I thought it was one of the more powerful images from the last show. 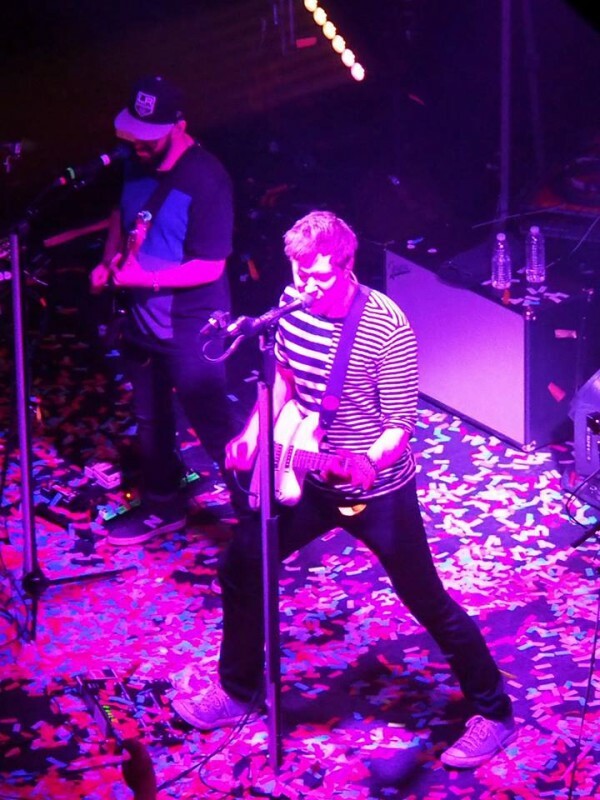 The band continued to play through their set including tracks such as “Skyscrapers” and “The One Moment”. They then played “Do What You Want” which segued into an amazing cover of Led Zeppelin’s “Black Dog”. 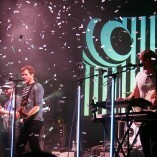 With that, the band said goodnight, which would have been a perfect end to an amazing show. But of course, there was more to come. 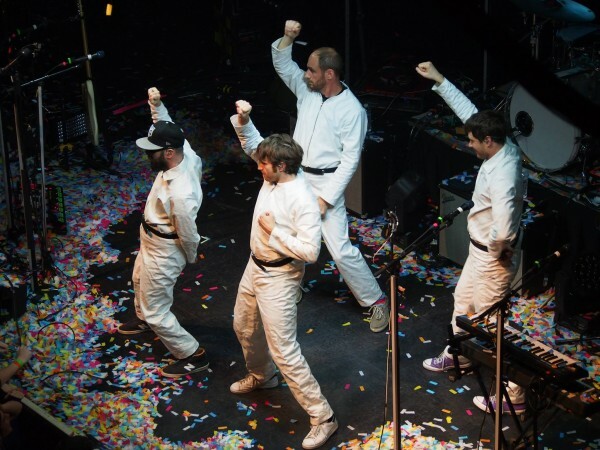 The band came out for an encore with the synchronized dance routine for “A million ways” wearing identical white jumpsuits. When that was done, the lights went down and the black lights came on, revealing fluorescent patterns on each jumpsuit. If you’ve ever seen Blue Man Group, it sort of looked like that. The band powered on through “White knuckles” before ending with the one-two punch of “I Won’t Let You Down” and “Here It Goes Again”. My son had the biggest grin on his face the entire time. The show was a religious experience for him. On the way out he proclaimed to me that OK Go was his new favorite band.